Teraburst gun to Guncon 2 project. I need a little help on the relay connection. 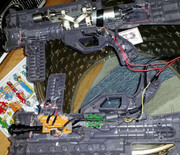 It only required that I cut the trigger wires from the ribbon cable to connect them to the new guns trigger button. And cutting the start / select board to wire it to the button on the front grip. The button on the bottom of the GC2 grip is going to a pedal I have. I can activate a regular powered relay board I have with the trigger (as it has it's own 5v psu) but the GC2 trigger doesn't seem to have enough power to activate the solid state relay. Has anyone here had any luck using a solid state relay with a GC2 trigger? Did it require an additional mosfet?